Search for this and so simple solution. Works great in Jessie and Stretch. I hope this solution help anybody with this video card ati. Can DebianDog save sessions on CD/DVD? Live-boot-2 provides the best options but works with live-boot-3 also. Better test using RW CD/DVD. Burn DebianDog on CD/DVD in multisession mode. This will create /live/10.dir with /live/cow copy inside. 10.dir will be loaded after boot at top of 01-filesystem.squashfs. Save new session using 11.dir, 12.dir etc. You can use as many folders as you wish with live-boot. None of them will use loop device so the options could be unlimited. Could be used with porteus-boot using something like next-save with mods to copy the session in RAM, create squashfs and write the squashfs to the CD/DVD. Edit: With small change in live-boot-2 and live-boot-3 initrd script toram will copy only /live folder content (instead whole medium) to ram loading all modules and .dir ending folders to ram. It was impossible option for hdd or usb drive frugal install before using toram. Now works and it is better for CD/DVD boot too. The changes in live-boot-2 and live-boot-3 scripts. The script savedir2dvd works with live-boot2 and live-boot-3 saving sessions in subfolders inside /live on multisession DVD. The command posted above works fine for direct burning /live/cow content on the DVD each session, but this script makes a copy with some cleaning and confirmation prompts (could be easy changed to make squashfs from the folder for porteus-boot support). Works well for my needs but save on DVD is still new area for me. Use it on your own risk! Copy and cleanup the folder before burning the session gives option to delete manually personal files and edit something before burning. The session size is much smaller compared to direct /live/cow burning and on next boot you will need less RAM space compared to direct /live/cow burning. At some point your RAM probably will not be enough for new sessions and you will have to boot without toram using the DVD (much slower system compared to copy to RAM). And since you can't unmount the DVD anymore you can't save more sessions to it. So be careful saving too many sessions and keep in mind how much RAM your computer have. Now booting the DVD with toram only parameter will copy and load the content of /live in RAM. Any new session you can save with savedir2dvd script and will be auto-loaded on boot. If you need extra module just mount the DVD and load on the fly the module from /sfs folder you need. You can burn new session with new modules inside /sfs as long as you have space on the DVD. What if something wrong happents and you can't boot after saving session? Just use toram=01-filesystem.squashfs parameter and only the main module will be loaded. Check out what is wrong with the last saved session folder and fix it burning next session with the fix. For example if it is incompatible xorg module burn the next session using the old module. Or if you deleted by mistake some important system file marked as .wh. in your last saved folder simply make new session with copy of this file. It will be available again after reboot. If you don't understand what I wrote above better skip reading and don't play with saving sessions on DVD. Just keep in mind it is an option you can use after spending some time to learn more about and do your own experiments. All above could be used with standard Debian Squeeze, Wheezy, Jessie. The script savedir2dvd works with dash but it still needs aufs boot. For Debian Stretch you can't use it because aufs is replaced with overlay and overlay doesn't support multiple .dir folders in /live loading yet. The only way to use it in Stretch is to build aufs module and boot with aufs. Still I can't tell if the changes in live-boot scripts the last year keep .dir loading working well. I haven't experimented save session on DVD with Stretch using aufs yet. Edit2: After some testing .dir loading seems to work with overlay too (not only with aufs) but I can't confirm there are no issues without more testing. Maybe I will experiment overlay saving session on DVD later. Hi I am using stretchDog 32 bit. It automatically log in as root user. Can I modify it so that I can automatic log in as puppy user. BTW I can switch to root user to puppy or vice versa but It will be helpful if I can directly log into puppy user. Can any one help me? DebianDog has user account puppy included or you can create new user using System -> Add New User GUI menu. In case using Jwm version typing in terminal xdm-start will boot to xdm login prompt. Typing xdm-stop will restore autologin as root. Thanks Saintless for your solution. For advanced users only because you need to rebuild initrd1.xz after editing linuxrc inside. Using live folder name still causes some confusion and problems with same live name folder on different partition. Since live-boot can use different boot folder name using live-media-path= maybe it will be convenient to remove hardcoded live directory from porteus-boot too. I use psubdir= like in Puppy because I find it better to use the same parameter, but can be changed to anything. Much more flexible options, closer to Puppy boot code and no need from subdir live anymore. Not so bad idea .So keep it also keeps closer to Puppy . Example with DebianDog-Squeeze-hybrid-30.04.2016.iso but should work with any DebianDog iso or forked version. Like live-boot you can use porteus-boot to boot from unpacked iso image after extracting vmlinuz1 and initrd1.xz on your hard drive. 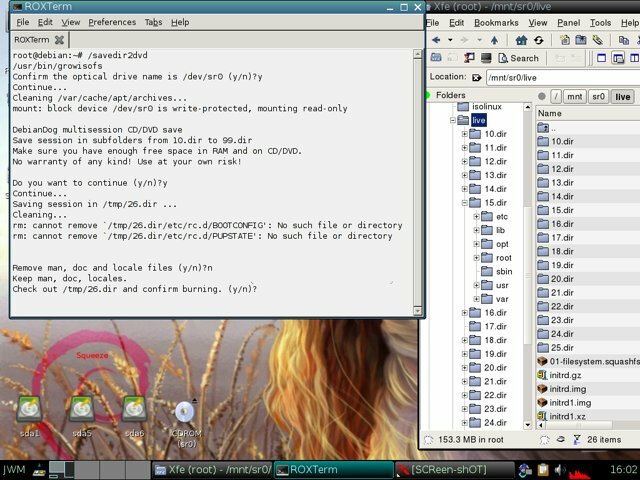 Create on sda1 folder named porteus (or any other name). Download/copy inside /porteus the iso image (DebianDog-Squeeze-hybrid-30.04.2016.iso in the example below). Mount the iso image and copy vmlinuz1 and initrd1.xz inside /porteus folder. You can do the same with live-boot using fromiso= boot code. The reason it isn't included by default in DebianDog is the same as we keep /usr/share/locale and man, doc, info files as separate modules out of the iso. libgl1-mesa-dri package provides many video drivers you will never need and the package size grows up each new stable Debian version. Here is how to keep the size small if you need 3d acceleration on your computer (example for DebianDog-Squeeze but works for any later version): Download libgl1-mesa-dri for your DebianDog version and extract the deb package. I need the intel driver only for my computer. Create directory /usr/lib/dri and copy only i810_dri.so from the extracted libgl1-mesa-dri deb package. I see 3 different drivers for Squeeze included but it is easy to find the correct one after trying one at a time. Exit X and startx and you have now working 3d acceleration adding only the size of the driver you actually need. To confirm the result you can install mesa-utils and type glxgears in terminal. By default Debian, Ubuntu, Porteus limits the real RAM size mounted as tmpfs to 50-60% of your real RAM size when using no-persistent boot. This is for a good reason but Porteus for example gives option to increase it by using ramsize= boot parameter. live-boot-2 - /live/cow mount point. You can read more and more suggestions to increase the tmpfs size by remounting and adding line in /etc/rc.local to automate this on boot. This is useful some times as long as you read the numbers. The safe number is 90% or less if you don't want to press the PC power button often. There is good reason to keep the real RAM size limited because once it gets full your system freezes, locks-up and the only option is hard reboot by pressing the power button on your machine. What will happen if you use 130% or even 200%? Nice because I can still write, open file manager, exit X or reboot without problems. OK, I can still write, open file manager, exit X or reboot without problems. My advice is to stop here and use 90% max. Lets follow the advices about 130% or 200% increase. Seems I can use 323Mb to store changes having only 256Mb real RAM (I can easy cheat the system I have 25Gb using 10000% increase). But only seems that way. Now the same copy operation with 500Mb file causes system lock-up and the only way out is hard reboot. Ramdisk (or tmpfs size) eats your real RAM and leaves less and less available RAM for programs to run. Any file or data you add or copy in your tmpfs leaves less and less RAM for program usage. Having the default 50-60% ramdisk leaves 50-40% RAM for programs usage always. Increasing the ramdisk size to 90% and filling up these 90% by installing/copying files leaves only 10% of your RAM for programs usage. But the problem is programs like htop will not calculate the ramdisk size usage as used RAM and will give you false information you still have around the same RAM size (256Mb RAM in my case instead only 25Mb real free RAM). Next time I start Firefox it will take seconds to freeze the system if I don't use swap. Increasing the default ramdisk size is something that needs more explaining before recommendation to use it. Thanks for detailed and competent explanation of this Topic . Debian and Ubuntu live systems are configured to use swap partitions on boot using boot parameter swapon (older live-boot and casper-boot) and swap (newer live-boot). You can't use swap file on boot adding the above parameters. Should work from /etc/rc.local script also. The problem is if you use swap or swapon parameter with live-boot (DebianDog) or casper-boot (MintPup, XenialDog) the /etc/fstab file will be replaced on boot and will overwrite your modified /etc/fstab hiding the line to load your custom swap file or other /etc/fstab mounts you made. In that case make sure to remove the parameter swap or swapon from your boot code and then your modified /etc/fstab will work. Porteus-boot also will use available swap partition (not swap file) on boot without adding extra parameters. If you use porteus-boot it shouldn't replace /etc/fstab even if swap partition is available. But if you add custom entry for swap file in /etc/fstab just in case add noswap parameter to your porteus-boot code. There is some confusion about how many squashfs modules can load DebianDog on boot and I read from time to time answers the number is 8 (from /dev/loop0 to /dev/loop7) and examples how to increase the number in porteus initrd1.xz linuxrc script. YES - live-boot can load only 8 squashfs modules on boot (but can load unlimited number of folders instead with much more comfortable RAM and CPU usage results compared to multiple squashfs modules loading). No - porteus-boot doesn't need any changes in linuxrc scripts and can load much more squashfs modules as it is in the oldest DebianDog-Squeeze and Wheezy versions. Tested with 40 squashfs modules inside /live, /live/base and /live/modules but the RAM/CPU usage was too much for my machine and reduced the number to 29-30 squashfs modules to make better testing and screenshot. The problem after booting is no more free loop devices. The system creates only the number it needs if more than 8 squashfs modules exist and exactly 8 loop devices if the squashfs modules are less than 8. The RAM/CPU usage with 30 modules loaded on boot is 5 - 6 time higher compared to only one module on my hardware but still this makes possible to save session on DVD with porteus-boot without changes in linuxrc by creating modules from changes and writing the module in /live folder on the DVD. Good information Toni, thanks. There are so many of these fine, otherwise somewhat hidden, details that are worth knowing and important to document as you are carefully doing.